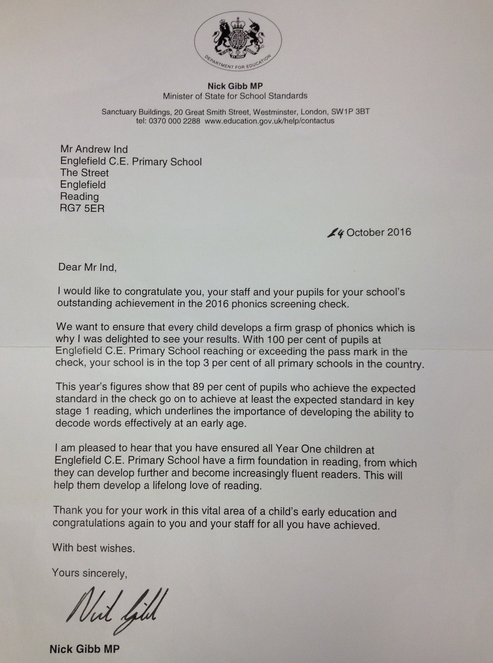 We have recently received a letter from Nick Gibb MP, the Minister of State for School Standards, congratulating us for our outstanding achievement in the 2016 phonics screening check. He also praised the school for being in the top 3% of primary schools in the country in relation to this standard. It is good to receive such recognition from the government and it further underlines the impact of all the hard work that went into delivering such a result last summer. Please see below to view a copy of the letter.